Different firms have different needs, challenges, and goals!! so why choose someone who treats every firm the same. We here at vertex understands every organization needs, technology, the way a firm works and celebrates with the organization’s success. Vertex has been a trusted partner in delivering IT infrastructure solutions for more than 25 years for different verticals. Learn more about what makes us different. We believe in customizing each solution to meet individual client requirements. With a customer-centric approach, we focus on understanding customers requirement, evaluate and implement customized IT solution. Our strong partnership has helped us offer robust End to End IT Infrastructure Solutions to our clients, to ensure seamless IT infrastructure being offered, we partner with the world’s best. 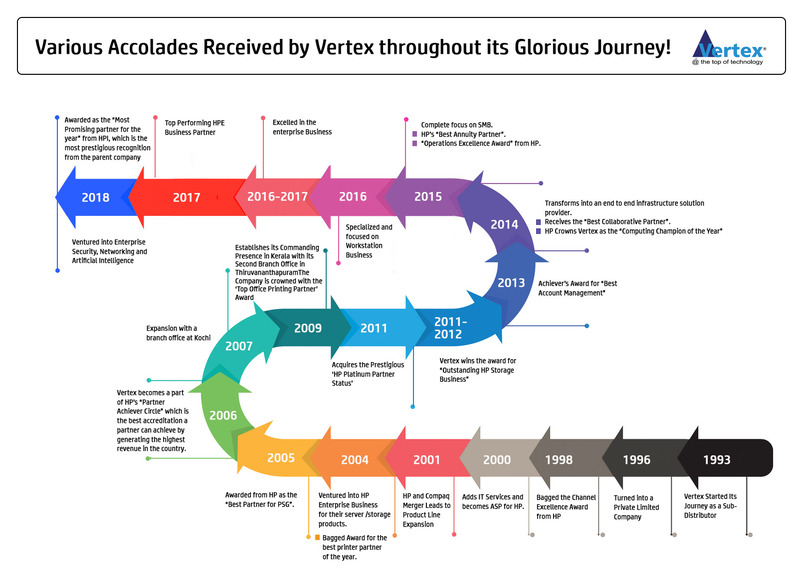 Vertex’s growth has been an eventful and highly charged journey towards excellence, a journey marked by pioneering achievements and strategies. We have been empowering and enabling business success with a secure and reliable IT infrastructure Solutions from the past 25 years, the one that is Pervasive, Cost-effective and Efficient.